This page collects older news items from the home page. 8 Oct. 2015: I have moved debtox.info to another web hoster due to problems with the services from KPN. There might still be some glitches; if you run into unexpected behaviour, please let me know. 13 August 2015: the site has a new look and feel! I moved everything from a php-based web-builder application to plain html. This makes it easier for me to maintain, and to move to another webhoster, if needed. The important old php links should redirect automatically to the new html pages. Some glitches may occur .... so please contact me if you hit an unexpected result. 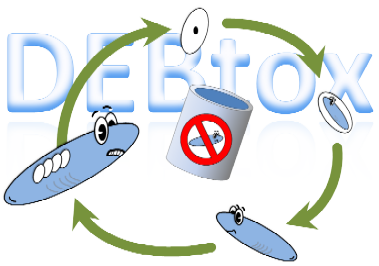 7 August 2015: moved my DEBtox Research activities to a dedicated website: www.debtox.nl. This info site will remain the place with information on models, sorftware, e-books, publications and courses. March 2015: the hits counter at the bottom of the page has now exceeded 100,000 hits! 21 June 2012. Check out Roman Ashauer advertising TKTD modelling in SETACs newsletter over here. 5 May 2012. On the discussion board, I started a forum on "Ecotox Essays".This forum will present short opinions and critical comments on an ecotoxicological topic. I will try to regulary write a contribution, but I also highly welcome contributions from others! See the board for further details. Also at the 2019 SETAC conference in Helsinki, there will be the spectacular “GUTS to the Max”: Mechanistic Effect Models Hackathon, organised by Roman Ashauer. More information. For 2019, a new round of the DEB telecourse is planned, and also a classroom part (1-6 April), followed by workshops (8-9 April), and the international DEB symposium (10-12 April). This time, the location will be Brest, France. More information is provided on the symposium website. Application to the DEB2019 school is open and the deadline is extended to February 15, 2019. If you are a young environmental scientist, make sure to check out the YES meeting in Ghent, 5-10 February 2019. I will be teaching a short course on DEBkiss there. Registration deadline is 18 December 2018. Dedicated 2-day GUTS course, geared towards professionals in risk assessment of pesticides. 16-18 October, Wageningen, the Netherlands. More information. As part of the 2019 SETAC conference in Helsinki, Sandrine Charles is organising a 1-day short course on GUTS (on 26 May 2019). Download the flyer. Sandrine is also organising a more extensive winter school 6-10 January 2020 (in Lyon, France) focussing on ecotox effect models. 27 August 2018: the EFSA opinion on TKTD models is now available over here. This opinion will be pivotal for the application of GUTS and DEBtox in environmental risk assessment (in particular for pesticides). 26 March 2018: the 2018 round of the TKTD modelling summer course DynModTox has been cancelled. 24 August 2016. We just finished the third round of the DynModTox summerschool in Denmark. Some impressions from the 2016 course over here. Wednesday 13 January, at the VU University, Carlos Teixeira defended his thesis entitled "Application of Dynamic Energy Budget theory for conservation relevant modelling of bird life histories." Announcement (in Dutch). On 2 June 2015, James Maino successfully defended his thesis entitled "The Importance of Body Size: Scaling of Physiological Traits in Insects" at the VU in Amsterdam. Announcement over here. On 8 May, Bas Kooijman will deliver his farewell speech at the VU University, which also marks the end of the Dept. of Theoretical Biology at this university. See the announcement (in Dutch). The trilogy booklet with Bas' inaugaral and farewell speeches can be downloaded over here. On 28-30 April 2015, there will be the fourth international DEB symposium in Marseille, France. Abstract submission is closed. As of 1 March 2015, Tjalling Jager has left the VU University to continue as a self-employed researcher under the name DEBtox Research. I will remain associated with the VU as a guest of the department of Animal Ecology. February-April 2015, there will be a new round of the DEB course. Part in tele-mode, and part hands-on in Marseille, France. More info. This will be the last course organised by Bas Kooijman, so don't miss it! 14 January, we had the succesful defense of Alpar Barsi, who's CREAM project was supervised by Virginie Ducrot and myself. His thesis can be found here. In August 2014, we provided the second summercourse on dynamic modelling in ecotoxicology. Impressions. 18 June 2013. Elke Zimmer and Ben Martin successfully defended their PhD theses! Congratulations! More info on Elke's thesis and Ben's thesis. Cancelled: the 2013 PhD summer course "Dynamic modelling of toxic effects". More details about the course over here. Mike Newman offers his course on quantitative methods in ecotoxicology (in the US) from 17-21 June 2013. See brochure. Webcast minicourse on DEB principles by Roger Nisbet 31 January till 21 February, see course description. An excellent starting point for people doing the DEB telecourse. On 24-26 April 2013, the third international DEB symposium was held on the island of Texel in the Netherlands. Details over here. In 2012, the first PhD summer course "Dynamic modelling of toxic effects" was held on 11-18th of August in Denmark, which focussed on TKTD modelling in general, and on GUTS and DEBtox in particular. Impressions from the 2012 course can be found over here. More details about the course over here. 8 December 2018: a new version of the GUTS e-book has been released at Leanpub. Most important change is in the statistical treatment. See version log at the support page for more details. 15 November 2018: a new version of the DEBkiss e-book has been released at Leanpub. 15 August 2018: update to the ring test results for BYOM. See the guts e-book page. 18 January 2018: The long-awaited GUTS e-book is released in Version 1.0! More information. 24 July 2017: Update of the "Making sense of chemical stress" e-book. Improved readability and update with new developments. 6 December 2016: New version of the DEBkiss book published. More information. 14 August 2015: small update to the technical document, adding a section on joint confidence regions. 11-12 August 2015: the e-books "Making sense of chemical stress" and "DEBkiss" have both been moved to the Leanpub publishing framework, and can be downloaded here and here, respectively. You can still get them for free, but also have the possibility to pay me (which will support future development of this and other books). 4 April 2015: small update of the DEBkiss book. 11 February 2015: New version of the DEBkiss book. 11 February 2015: Small update of the technical background document. 15 October 2014: New version 1.1 of the e-book "Making sense of chemical stress" over here. Added a chapter with two case studies. 15 June 2014. Version 1.1 of the e-book on DEBkiss is now available over here. Some minor changes. 18 May 2014. Version 1.0 of the e-book on DEBkiss is now available over here. Basically an embellished version of our JTB paper. 14 June 2013. Version 1.0 of the e-book now available for download over here. Small changes relative to Beta 1 version. 20 Sept. 2012. The first Beta 1 version of the technical document for the e-book over here. 9 April 2012. The first Beta 1 version of the free e-book "Making Sense of Chemical Stress" is available for download over here. 7 September 2018: small update of BYOM to v. 4.2c and updated GUTS package v. 2.3. More details on the BYOM page. 13 August 2018: a quick update of BYOM to v. 4.2b. This was needed as I found some errors in conjunction with GUTS package. See BYOM page for details. 9 August 2018: updates of packages 'dose-response', 'acute Calanus', and 'support marecotox'. The dose-response package also has a nicer walkthrough. See BYOM page. 7 August 2018: new version of BYOM and the GUTS package, fixing the issue with the likelihood-region method. More details on the BYOM page. 28 June 2018: running simulations for GUTS, I am getting confirmation that the likelihood-region method (as implemented in BYOM) is yielding exaggerated confidence intervals on model predictions. More details on the BYOM page. In 2018/2019 we will be producing a user-friendly software for GUTS. More information. 1 February 2018: New versions of BYOM and the GUTS package. See the BYOM page. 12 May 2017: Spotted a small error in BYOM when calculatin the intervals on LC50s with the likelihood-region method. This corrected in a small update to version 4.01. 27-28 April 2017: Release of BYOM 4.0 on the BYOM page. This is a major update, with many new features, but old scripts and packages will not work anymore! All packages have been updated; the two GUTS packages have been combined, and some have been renamed for clarity. 6 April 2017: Added the Beta 3 test version of BYOM 4.0 on the BYOM page. Also a new version of the GUTS package is included. 15 February 2017: Added a Beta test version of BYOM 4.0 on the BYOM page. This is still under testing, but feel free to play with it. Also, I added some warnings for users of profiling and slice sampling with BYOM. 5 January 2017: New version of the BYOM platform available for download. 7 April 2016. Small update of the BYOM modelling framework in Matlab. 25 and 27 August: another update of BYOM (sorry, found some small errors again). Additionally, an updated version of the DEBtox1 package (also demonstrating the improved population growth rate calculation). Updates of GUTS1 and DEBkiss1 packages. And ... a totally new package: DEBkiss_tox1, which is DEBkiss turned into a TKTD model. 29 August: update of the GUTS2 and DEBkiss2 package as well. All packages now have a walk through. 21 August: update of BYOM. Corrected a few errors and added some new functionality that will be demonstrated in future packages. 30 June 2015: update of BYOM. Corrected some errors and included a few extra options. 17 April 2015: update of DEBtoxM flavours Surv, GUTS and DEBtox. The DEB3 flavour is no longer offered. 3 April 2015: major update of BYOM. Some alternative optimisation methods are included, plus the possibility to fit parameters on log-scale. And ... the possibility to publish the code in Matlab (see the walkthrough of the BYOM code). Also a new version of the manual is provided. 18 February 2015: update of BYOM and the GUTS2 package. Main change is to avoid warnings with newer versions on Matlab (due to different way of dealing with interpolations), and the option to plot in black-and-white with different symbols (as in the DEBtoxM flavours). 2 January 2015: tiny 2.02 update for BYOM, and extended the BYOM manual, and gave a seperate entry on the BYOM download page. 17 December 2014: New version of the BYOM files to version 2.0. Major change is the possibility to have more than one data set per stage, and a brand new simulation engine. As of version 1.5, cleaner and simpler BYOM scripts. New packages for GUTS, DEBtox and some nice examples for the simulator! (Version 2.01 also has a small update to the manual). 29 November 2014: New version of the BYOM files. Major change is the removal of the calculation and plotting from the basic script into an engine script, which takes away a lot of complexity from the user. 1 May 2014. New version 1.5 of BYOM files posted over here. Also, a new package general package for DEBkiss. 29 Jan. 2013. New version 1.4 of the BYOM package, and the GUTS and DEBkiss packages over here. 29 Aug. 2012. New version 1.3 of the BYOM package over here. 30 June 2012. The flexible modelling platform BYOM is available over here. 19 May 2012. New versions of all flavours posted over here. New versions were needed because of an error in the calculation of the likelihood function for replicated graded data (with different number of individuals per replicate). Further, changes are made to increase flexibility and ease of operation. 9 January 2019: new paper on automated high-throughput measurements of body size (which could really facilitate DEB(tox) application in the future). Open access. Note that this is my 100th (co-)authored paper ;-). 8 August 2018: new paper out on modelling bioenergetics in early life stages of cod: 50-day free download link. 1 January 2017: Our GUTS paper has just hit 100 citations in Web of Science! DOI 10.1021/es103092a. October 2016: The book "Marine Ecotoxicology: current Knowledge and Future Issues" has just come out. I wrote a chapter "Dynamic modelling for uptake and effects of chemicals" in there. The book can obtained from Elsevier or your favourite bookstore, or via ScienceDirect. The support page for my chapter can be found over here. Jager T, Ravagnan E (2015). Parameterising a generic model for the dynamic energy budget of Antarctic krill, Euphausia superba. Mar Ecol Progr Ser 519:115-128 DOI 10.3354/meps11098. Just appeared: the 2014 special issue on DEB research in the Journal of Sea Research. Find it here.